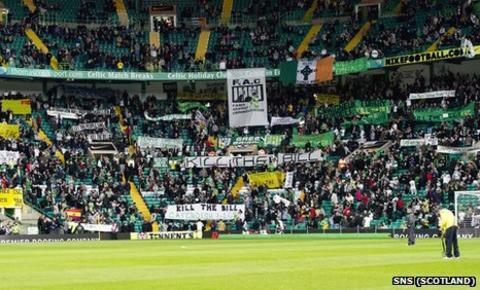 The Scottish Premier League will take no action against Celtic after looking into reports of pro-IRA chants. Having quizzed representatives from the police and the club, the SPL found that Celtic "took all reasonably practicable steps" to prevent the behaviour. "It is not disputed that a small number of Celtic fans engaged in singing and chanting in support of the IRA," read a statement from the SPL. "Such behaviour is unacceptable and unwelcome at SPL matches." Police match commander Eddie Smith had reported the offensive singing following Celtic's home match against Hibernian on 29 October. The SPL say their investigation included "meetings with the Head of Operations at Celtic FC; the Divisional Commander (Chief Superintendent), Strathclyde Police E Division; the Match Commander (Superintendent), Strathclyde Police on the day of the fixture and the Head of the Football Co-ordination Unit Scotland (Superintendent), Strathclyde Police." Adding that: "Written statements were also received from the Safety Officer, Celtic FC and from the Steward Supervisor, Celtic FC responsible for the relevant section of Celtic Park." The SPL also say that repeated condemnation of such behaviour from manager Neil Lennon and chief executive Peter Lawwell was taken into consideration. The statement concluded: "The ongoing work amongst the club, supporters and police to ensure that any unacceptable conduct is eradicated from Celtic Park is noted and is welcomed." On 8 December, there will be a Uefa hearing on a similar accusation surrounding Celtic's Europa League home game against Rennes on 3 November.